Depending on where you live in the country and the time of year, your windshield could be more likely to experience issues with cracking, scratching, pitting and holes and even bug debris. But how do you ensure you have the best protection for your windshield? Also, if you experience any breakage, what can you do for a quick, easy yet quality repair to prevent future problems? Another option to consider is a protective film. These are typically after market products. You can purchase them through a brick and mortar retail store or even online. They are essentially invisible and protect your windshield from small rocks on the road, or during the winter if sand is used to combat the snow and ice. This also helps in preventing many small cracks from the direct rock hit. But equally important is the fact that it can even protect you from rain and the bad or harmful UV ray protection. Not only does the UV protection help protect you from those harmful rays, but it can help protect the interior of your car from fading and cracking. But do your research, as there are different qualities, some with greater durability or more reliable. But what do you do when your windshield is already pitted due to all those little rocks flying directly at your windshield? Or the spider webbed cracking surrounding a large rock hole? Well, if you have excessive pitting causing a lot of sun glare and reflection off the pits you may just need to replace the windshield if it is too distracting. But if you have just a couple cracks or holes, you can go to a windshield repairman either at an auto detailer or sometimes you can find little stands on the side of the road. These individuals drill a small hole in the center of the hole or in the small cracks spurring off the hole. These little holes ease the tension of the splintered cracks taking away a little of the stress off the cracked glass. They then fill the holes with and adhesive and filler, and can almost completely eliminate the cracks from visibility. These sections of the glass have then been reinforced to be almost stronger than the original un-cracked glass. The benefit to this is it stops small cracks from growing to larger and can thus save you from have cracks webbed across your entire windshield. In many States, it is illegal to have a cracked windshield, so this small corrective action can save you from having to replace the full windshield. 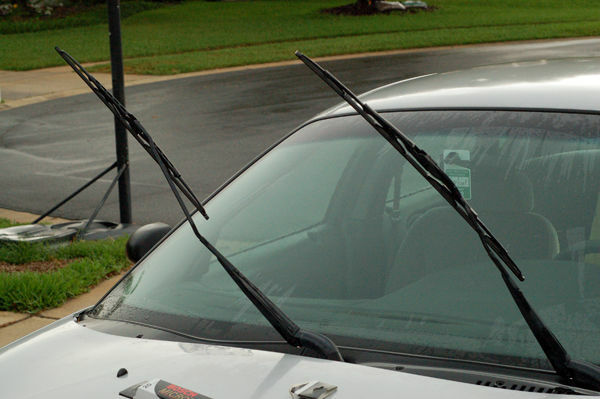 In summation, there are products on the market to help you prevent any windshield damage in the first place, but also options for you should you experience some minor to moderate breaks and cracks. Written by Marc Laferierre, owner of Dents Unlimited. Dents Unlimited has the best windshield replacement Columbia MO has to offer, where their expert staff can get your car back on the road in no time.